You can now add multiple Google Ads accounts. Learn about the Adzooma Early Access Programme too. Since launch, one of the most requested features from our customers has been support for multiple Google Ads accounts. Well, we listened. And we’re now ready to show you the results. 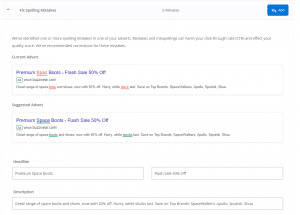 If you have multiple Google Ads accounts, you can now connect each of them to your Adzooma Pro account. This allows you to access reports, opportunities and automation across all of your accounts in just a few clicks. Whether you’re an agency or business looking to manage many accounts at scale, or you’re running PPC campaigns as a freelancer, you’ll love what this brings to the table. Setup is quick and easy because Adzooma Pro automatically detects your additional accounts. Add the ones you want to include right from the dashboard. Switching accounts is just as easy. You can do it from the top right of your dashboard. Move quickly between your top five accounts or search by name or account number. It took plenty of tea and typing, we can tell you. But we’re extremely pleased to make Adzooma Pro available to a wider range of users. People with a single Google Ads account to agencies with hundreds of clients are catered for. If there’s a mistake in the headline or description of an ad, the tool will identify it and suggest a fixed advert. If your website or landing page has a telephone number, this opportunity will recommend adding that telephone number to your advert as a Call Extension. Google Ads can show your adverts to people searching in or showing interest in the campaign’s chosen locations. Our tool digs into the data and finds out which setup works for your campaign. If there’s a problem, you are notified and can take action. There are a host of new opportunities concerning negative and conflicting keywords. For example, you can now use shared Negative Keyword sets across your campaigns. There’s no rest for the wicked (or developers). Keep an eye out for more updates to the software. We’re working on single keyword ad groups, landing page speed and experience and much more when it comes to opportunities. A new UI option for opportunities is also on the cards and we look forward to telling you about it. While you’re here, we’re on the hunt for an exclusive group of users to help provide feedback on new features and further develop our product. Most PPC management tools are developed and then pushed out to users. This is a chance for you to tell us what you want and get it added to a tool you’ll love. Early access to new features and tools before they become generally available. Direct access to the product team to provide feedback and ask questions. Exclusive access to extended trials and discounts. Access is by invitation only, but if you’re interested, we’d love to hear from you.